The search for happiness really is as old as our species and, quite understandably, has a major influence on our actions. It therefore sounds logical that, if we want more control over our brains, we should start by understanding what makes us happy. 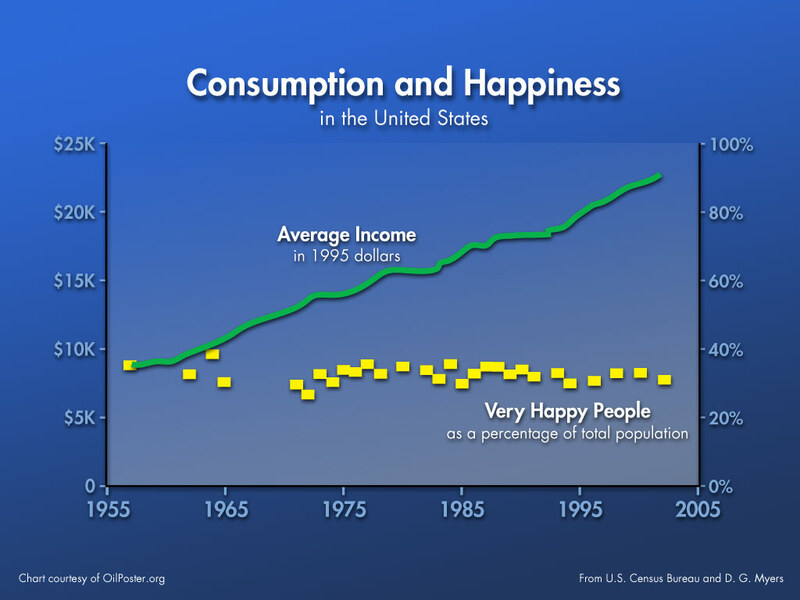 In this first happiness post, we will look at one possible road to happiness: increased consumption. This topic is covered first simply because the actions of the world appear to suggest that increased consumption is the primary goal of human existence. People will do extraordinary things for money and the things money can buy. Actually, our entire way of life (our fundamentally flawed system of perpetual exponential economic expansion) is based on the assumption that increased consumption will improve the human condition. This is what economic growth is. Increased GDP = increased consumption. So, can money buy happiness? From the data, the answer is yes … up to a point – a point that most developed world citizens have long since crossed. Data collected by the good people who put together the Happy Planet Index shows this trend quite clearly. 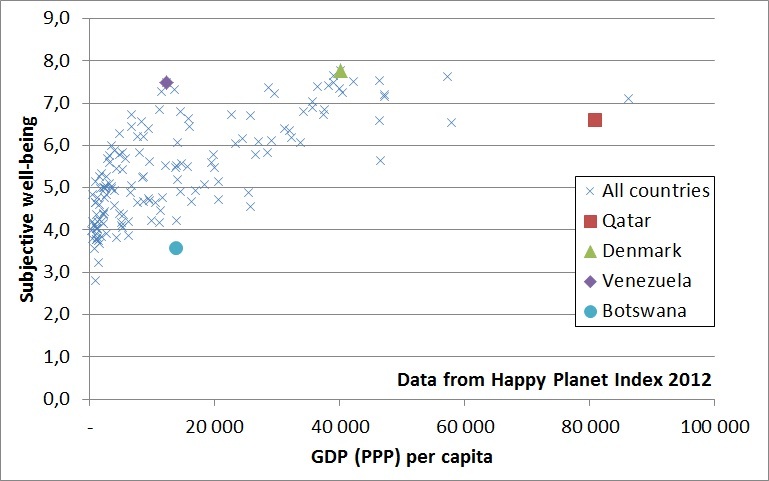 Initial increases in GDP per capita (personal consumption) cause strong increases in happiness, but further increases have progressively smaller influences. 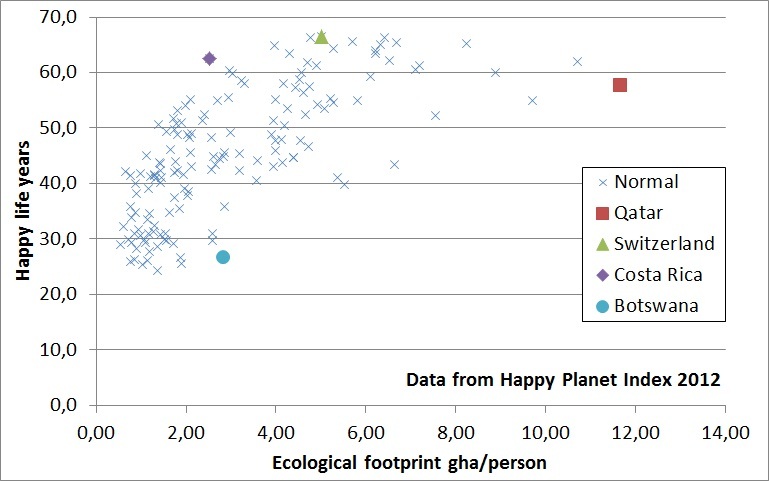 When plotting the number of happy life years (happiness multiplied by life expectancy) achieved by the average person against the ecological damages caused in the process, a very similar pattern emerges. It is therefore clear that increasing ecological footprints bring longer and happier lives only up to a point. In addition, measurements of average happiness over time also confirm that gradual increases in material consumption over time bring little or no happiness. This trend for the USA has featured quite regularly on this blog. But still, income remains a small, albeit significant, factor in determining happiness within nations, implying that it is not so much the absolute consumption that influences happiness, but more the relative consumption. Our very sad “keeping up with the Joneses” dynamic therefore appears to decrease the happiness of those who perceive themselves to have inferior material possessions relative to their peers. But the primary point that should be taken away from these data is that, in developed nations, consumption only has a very minor influence on happiness. Inflicting further damages on our planet through even more unsustainable consumption will not bring any more happy life years. 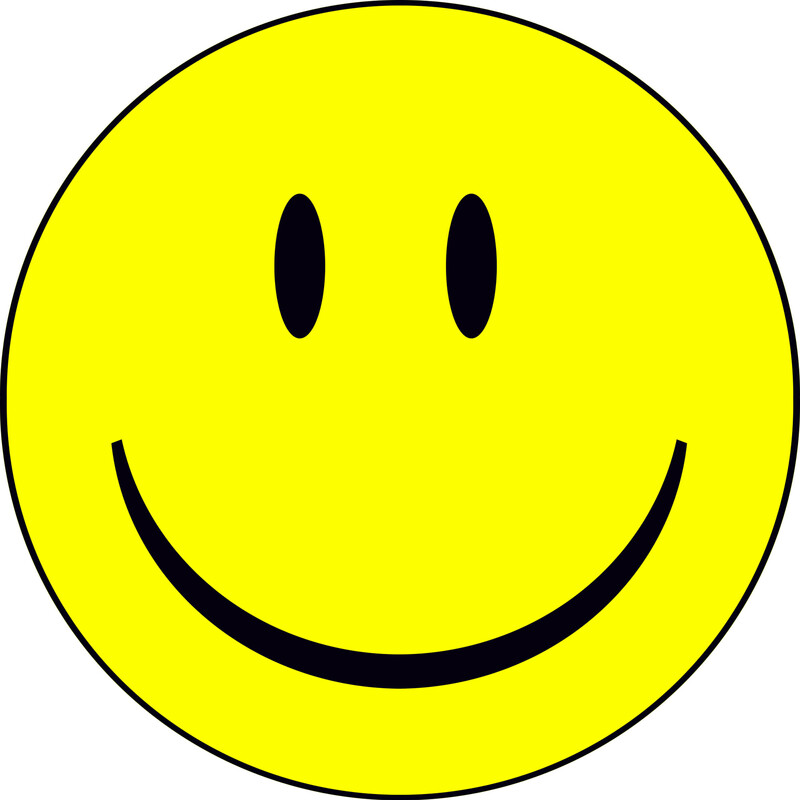 As we will discuss in the next post, happiness can be gained much more easily in much more ecologically intelligent ways. Our economic system must grow every single year for it to continue existing. 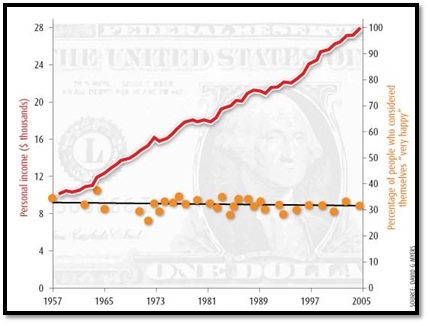 If the nominal GDP stops growing, unemployment will rise, people will not be able to pay back their extraordinary amounts of debt and the entire system will implode. The fact is, however, that perpetual exponential growth will run headlong into fixed planetary boundaries probably within this decade. This will cause the cost of living to spike as never before, plunging hundreds of millions into poverty and have hundreds of millions more fighting for their very survival. In order to prevent this from happening, our civilisation requires massive infrastructure investments in the sectors of renewable energy, sustainable agriculture, water management, waste management, clean transportation, clean industry and green urbanization. Unfortunately, however, our labor market is structured totally for consumerism and is therefore totally incapable of pulling this off. If you look at the labor market of any developed country, you will see that we manufacture/produce almost nothing. 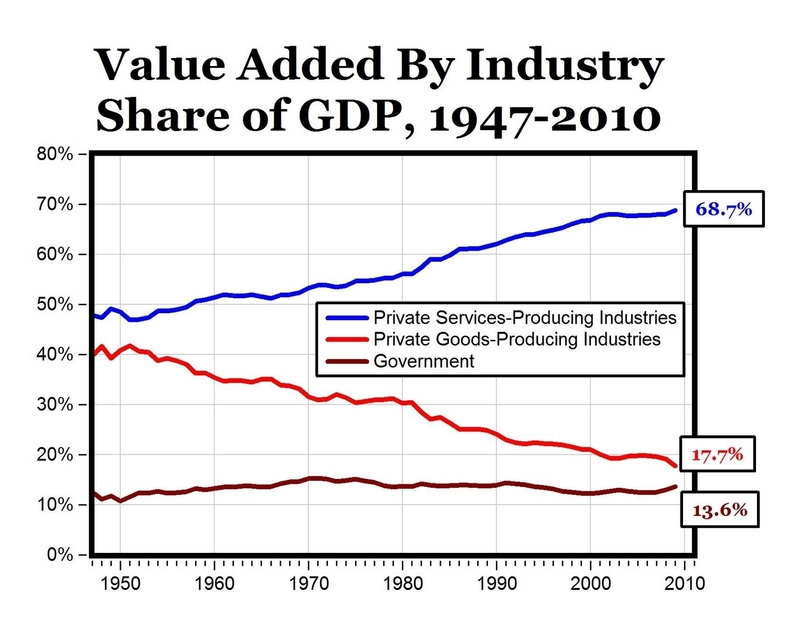 The vast majority of the labor market is in the service sector, designed to bring goods produced by other nations to local consumers as effectively as possible. In the USA for example, less than 2% of the workforce are qualified as engineers/architects implying that, even if we miraculously manage to scrape together the money, we most certainly don’t have the manpower required to construct this massive amount of new infrastructure. Meanwhile, our already unsustainable carbon footprint, ecological footprint, debt, social inequality and societal complexity continue to rise year in and year out. How long do you think we can keep this up? 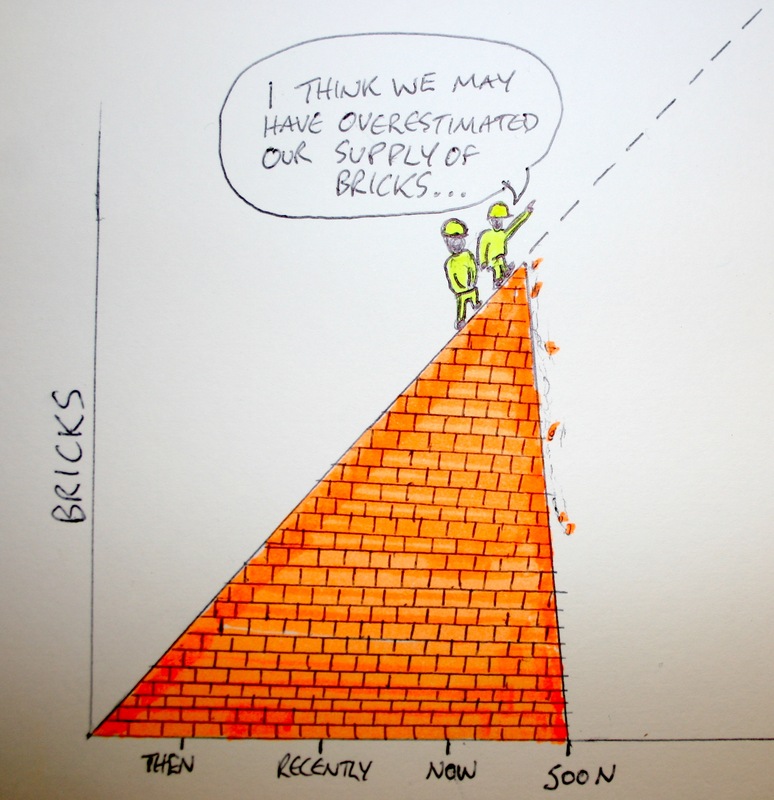 People (and counties) are constantly measuring themselves up against each other. This can be a good thing and lead to some healthy progress, but unfortunately, we tend to measure progress and prosperity in all the wrong ways. 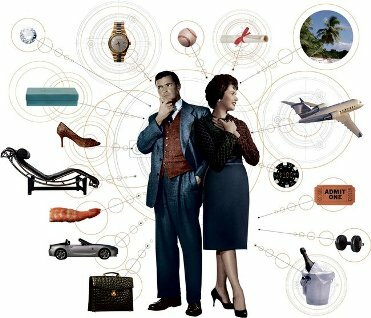 People (and countries) still value conspicuous consumption very highly. For individuals, this can be reflected in a massive house, many fancy cars and a walk-in wardrobe with enough clothes and shoes to open a small retail outlet. For countries, it is that all-important measure called GDP. 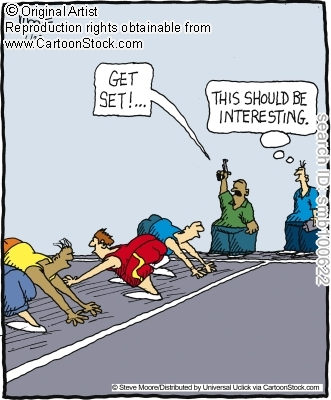 Now there is nothing wrong with a little healthy competition, but if most of the contestants in the race are running in the wrong direction, you have a problem. The real goal is a happy, healthy, wealthy and sustainable life, but unfortunately, most of us are constantly becoming unhappier, unhealthier, more broke and an ever-growing burden on the planet. 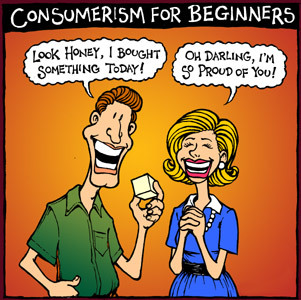 The fundamental mindset that has gotten us running in the wrong direction is called consumerism. As we have discussed before, consumerism does not bring any happiness and presents a big threat to our environment, our economy and our social structures. We really have to start running in the right direction. The correct measures of individual success are linked on the right-hand sidebar of this blog under “lifestyle calculators” and the correct measure of success for a country is called the Happy Planet Index. Please determine how you are faring in this crucial race and then please make a commitment to at least start running in the right direction. This is a very important distinction to be made on our way to a more sustainable life. In practice, growth means “more”, while prosperity means “better”. 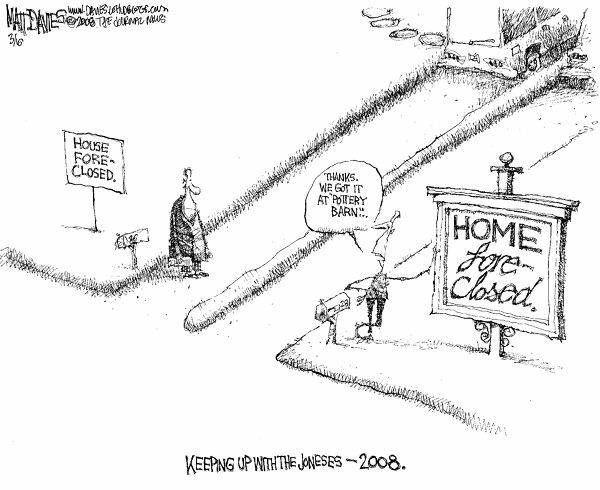 Sustainable living demands that we consistently choose prosperity over growth. Unfortunately, our society has become totally obsessed with growth. We see 5000 advertising messages per day screaming at us to buy more stuff, our malls are filled with “bargains” trying to get us to buy things that we don’t even need, and low-cost-low-quality consumables of all kinds are now so common that it has become the norm to replace our entire arsenal of miscellaneous stuff yearly. 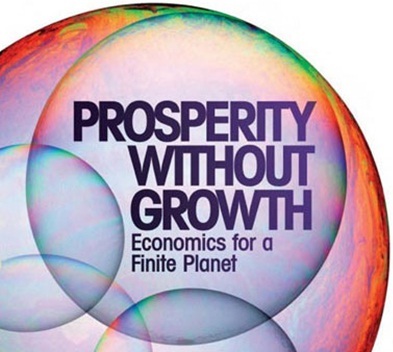 With regard to the environment, growth implies that we consume more and more planetary resources (both because growth-oriented consumables are so cheap and because they break all the time), while prosperity implies the exact opposite. When looking at the economy, low quality, growth-oriented products derive their price from the planetary resources they are made of, while high quality, prosperity-oriented products derive their value from the labour needed to develop and produce products of real quality. And when it comes to personal finances, high quality, long-lasting products will often actually work out cheaper in the long run becuase they have a very long lifetime and tend to run much more cost-effectively. Choosing prosperity over growth therefore implies that we will take less from the environment while simultaneously increasing the number of jobs in the economy and raising the standard of living of individual consumers. Pretty handy combo, right? So, next time you are out shopping, make our world a better place by choosing prosperity over growth. So, thus far we have seen that consumerism leads to major ecological, economic and societal problems, but has still managed to become completely ingrained into our way of life. There must be a good reason for this and, if the advertising industry is to be believed, this reason must be euphoric happiness through consumption. Unfortunately though, research has clearly shown that developed nations are not becoming any happier despite them consuming like we had 4 planets and leaving carbon footprints 10 times that which is sustainable. 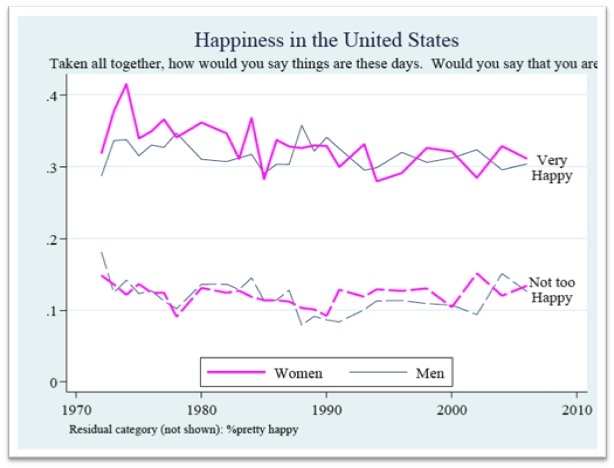 It has even been shown that very happy people are on the decline with rising consumption, especially among women. So, in effect we are killing our planet, ruining our economy and creating massive social inequality all for no reward whatsoever. And, as discussed quite often on this blog, this massive over-consumption also ruins our health, personal finances and creative capacity. I don’t know about you, but to me this qualifies as utter insanity. We desperately need to break out of this very dangerous and self-destructive cultural trance.